Firstly this website has turned 3 years old and addition to that it has accumulated over 200,000 views in that time span. So I guess a couple of pats on the back for me but more importantly a big thanks to anyone and everyone who has taken the time to ever read any of my musings. Off the back of that though you may well be asking the question “just where have you been lately?”, the answer to that is unfortunately not here but at the same time that has not necessarily been a bad thing either as my writing “career” is going from strength to strength. I’m not going to lie these past 12 months have been something of an almighty struggle at times, the main reason being that in the first two years of operations I was running the website while still working a mundane job as a Data Analyst – how I pumped out that much content while working a full time job is pretty staggering. Actually I know the answer to that one – I was working on the website while getting paid (to not) do a full time job. Anyhow those surreptitious days came to an end last April as I decided to go fully freelance and make a go of this website. However without having the security of a full time wage behind it meant it was going to need even more time to try and make it a viable concern, something I perhaps did not have. Add in getting hacked and a Google algorithm penalty to boot and the time spent was not returning anywhere near the money required to keep it going. People who have taken the time to read this website have always said that the work was great, but unfortunately for me not enough people were seeing it. Perhaps that has been my weakness, I can write about football until the cows come home but perhaps lack networking skills to really get my work out there. Also no disrespect to either Burnley vs Stoke fans but it was very hard to type up a 600 word preview about your upcoming game when I was worrying about how I was going to pay the following month’s rent. So although I had put a lot of time into this it was getting to the point where the website was becoming a lost cause. Thankfully though as one door closes, in my case many more have opened. I think in any walk of like you sometimes need to take a step back or get the opinions of others. You can be so far deep rooted in a project that you’ll keep going and going even if it is to the detriment of yourself. So after taking that step back and getting the advice it came down to the fact ‘how is this going to make you money’ quite simply I had come too far to just walk away and go back to a full time job that I didn’t want to do, not only that but I was making some real progress and it was a case of pushing this on to the next level. 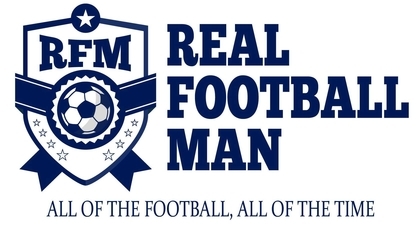 Ultimately this meant having to accept that perhaps Real Football Man was not going to make me rich but I can certainly offer my services to elsewhere. Something that over the past few months I have been doing and now I finally feel I’m getting the rewards for all the efforts that I’ve put in over the past few years. At the end of the day this only started as a hobby because I probably had too much time on my hands and no outlet in which to air my views, the thought of getting paid to do so never even crossed my mind so in that sense it has been an incredible vehicle for me. Not only that though but starting the website in the first place has allowed me to be a part or start up on my projects, for example I now work as a freelance football statistician – something that has allowed me to merge my love of football and my previous analyst experience. In addition to this I am now writing for some really top level clients such as Physioroom and Sportslens so a big shout out to them, while I also am doing a lot of unbranded work for third parties so although my name is not on these articles my words are certainly there to be read. Not only that but starting the website has allowed me to gain some really good social media traction (twitter) and it has also allowed me to become the host of the e-spurs podcast, a role that is incredibly enjoyable and I hope it goes from strength to strength next season and beyond. And that is a statement that I hope rings true for me. I’ve got a few plans that I am looking to kick start in time for the new season – although that said I will keep most of them under wraps for now. One thing for certain though is that I am going to expand on my sister website Real Football Data. I think I’ve done my “apprenticeship” as it were writing endless match previews and transfer rumours it is now time to focus on what can push my career further. When freelance time literally is money and as much I would love to have it, I don’t have unlimited amount. So the key for next season is to not only work harder but work smarter, something that Real Football Man probably won’t allow me to do. That does not mean it is the end of the project but it will not be my main focus, however I will look back on this project with incredible pride as although I’m not quite where I want to be I know I am definitely heading in the right direction. So that’s an update from me, thanks for taking the time to read this and more importantly thanks for stopping by over the past three years as without you guys it would have never got off the ground. It’s been fun if not tiring at times, I hope you’ve enjoyed my views and opinions.